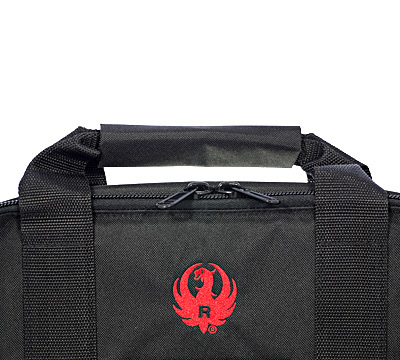 Tactical pistol case with red Ruger logo. 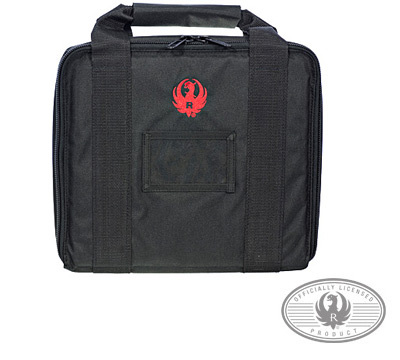 This black durable, water resistant 600 denier polyester pistol case with 10mm PE padding provides protection and convenient transportation of your pistol, magazines, and other accessories. 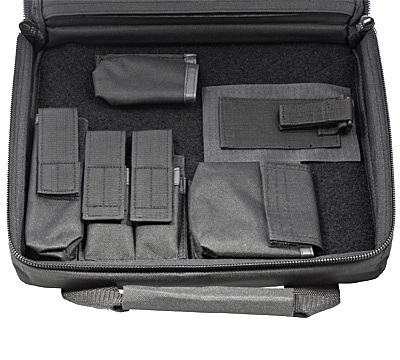 The interior of the case features a Velcro® base allowing the pouches and strap to be reposition to accommodate different handguns. Padded ridged sides and YKK zippers protect the contents. 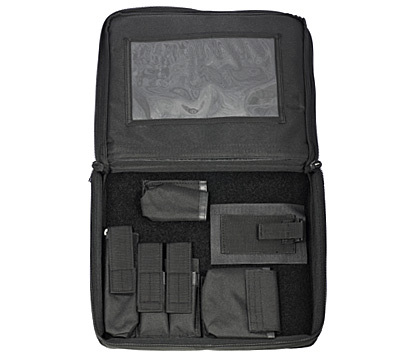 Features include a full wraparound heavy duty handle, interior pouches for universal holster, cable lock pouch, dual magazine and UTL light; front window for name card and an interior window for instruction manual. Exterior measurements: 13.5" x 12" x 2.5". Interior measurements: 12.5" x 10" x 1.75". Made by Regal Industrial Sales, Inc. WARNING: This product can expose you to chemicals including lead, which is known to the State of California to cause cancer and birth defects or other reproductive harm. For more information, go to - www.P65Warnings.ca.gov. Use of this product including its use after discharging firearms in poorly ventilated areas, cleaning firearms, or handling ammunition may result in exposure to lead. Have adequate ventilation at all times and wash hands thoroughly after handling this product. I like this case! Ill preface by saying I also own some others that are a bit heavier duty, but this ones no slouch. The Cordura material is amply rugged and heavy, if not the heaviest grade. I like the BIG window pouch inside the top lid. 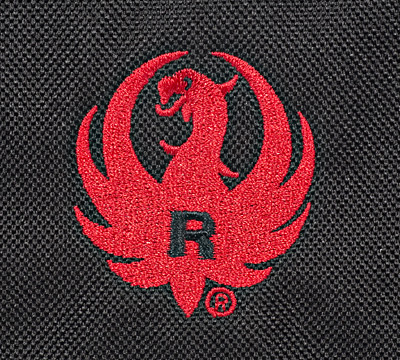 I like the embroidered RUGER emblem on the front. I like the two little inset partitions in the rectangular pouch. To be fair, of no use I can think of, is the suppressor pouch, which is the same width as a double stack magazine. That rules out holding all bit the thinnest suppressors. The zipper is heavy duty. The Velcro attachments are heavy duty and seem really solid. Overall workmanship didnt show any defects at all. Bad points - narrow suppressor pouch. Double stack mag pouches could have been just a hair longer, but its a nit pick. The front of the pistol retention system could have been a bit fatter too, but its workable with my new Ruger American 45 auto. Ill still give it a 5/5, as my critical items are really minor. Its a great case. I fit a MKIII Hunter, 6.9 bbl, with a Bushnell Trophy Red Dot TRS-25 sight and 6 mags. Still room for a few tools and some ammo. Nice case for a Nice Pistol. Grips are the checkered cocobolo thumbnuts grips - right handed so a little thicker than normal and still work.